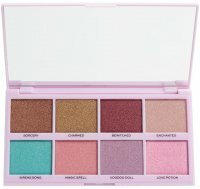 PRESSED EYESHADOWS PALETTE - NATURALLY MATTE by AFFECT. 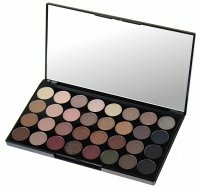 Palette of 10 pressed shadows. It contains shades with matte finish only, which have velvety, easy-to-apply consistency. Thanks to innovative formula, the shadows blend perfectly and stay on skin for many hours. The product will meet expectations of even the most demanding customers. Universal color scheme will allow you to create both natural, daily makeup and evening smokey eye. Set of 10 eye shadows. Thanks to the formula, the shadows do not shed or fold in the crease. Perfect for both amateurs and professionals. - M-0110 - brown with lots of red tones. Very good pallete, highly pigmentated and log lasting.